Tokyo, January 10, 2014 – Fuji Heavy Industries Ltd. (FHI) - the maker of Subaru automobiles and Subaru Tecnica International Inc. (STI)*1 unveiled the new racing car developed from the all-new WRX STI for 24 Hours Nürburgring endurance race in 2014 and announced an outline of SUBARU Motorsport activities for 2014 at the　Tokyo Auto Salon 2014 with NAPAC (Japan Car Parts and Aftermarket Promotion Association). STI will participate in the Nürburgring 24-Hour Race (from 19 to 22 June in Germany) for seven consecutive years, with a vehicle whose performance has been enhanced from its base car – the all-new Subaru WRX STI to be revealed at the 2014 North American International Auto Show in Detroit. With the new driving machine's participation in this race, FHI and STI enhanced mutual cooperation to develop a racing car which boasts a higher level of competitiveness by utilizing the technologies of Subaru's mass-produced models. 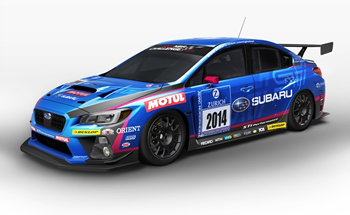 STI will aim at its third victory in the SP3T class this year following the 24-hour race in 2012. Through the participation in the race that demands speed and stability, Subaru will further enhance its engineering excellence. Like last year, Hideharu Tatsumi will take the helm of team operations as team manager, in addition to the development of the car. As for team drivers, Toshihiro Yoshida and Kouta Sasaki both from Japan will be listed, adding two more drivers from Europe. In the last season, "SUBARU BRZ GT300" race car snatched pole position five times in eight races and achieved a class win. With the upgraded 2014 version of this model, STI will aim at a series win this year. As in previous years, the team will be operated in conjunction with "R&D SPORT" led by Director Shinji Motojima, and Kouta Sasaki and newly joined Takuto Iguchi will be driving for the team. At the same level as previous years, SUBARU will continue to support private drivers who will participate in the FIA World Rally Championship 2 (WRC2) and European Rally Championship (ERC).